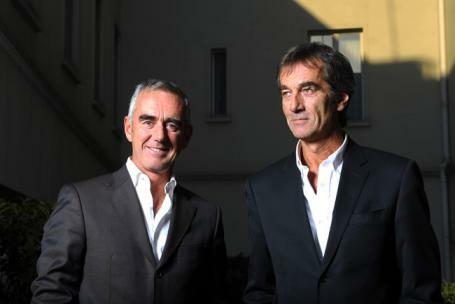 to raise a campaign for the next America's Cup in 2013. Loick and Bruno are the leading multihull sailors in the world but for 30 years have raced against each other as fierce opponents. Now they are joining forces for discussions with various French parties to launch a bid to bring the America’s Cup, which will be raced on multihulls in 2013, to France for the first time in its history. They are also talking with German yacht racing luminary Jochen Schumann and his partner Stephane Kandler about forming a Franco-German collaboration on the same lines as the All4One team, which has been campaigning the Louis Vuitton Trophy over the past year. A French campaign was widely anticipated due to their superior expertise in multihulls, garnered from many years of high speed offshore racing in catamarans and trimarans. Bruno is three times holder of the Jules Verne Trophy while his younger brother was the helmsman on Alinghi when they were defeated by BMW Oracle in the 33rd America's Cup in February. Their achievements in multihull racing are many, varied and highly distinguished which will go some considerable way in balancing the playing field with BMW Oracle, a field that Team Origin's Sir Keith Mills recently found too skewed in the Americans favour to commit his £100 million budget. “We’ve always been told and quite rightly that the America’s Cup is reserved for specialists...which is good news for us," said Loick Peyron. The brothers have now given themselves three months to raise a team and the funds for a competitive campaign. "Will France allow other nations to catch up in three years what we have acquired over 30?," asked Bruno Peyron. "We have three months ahead of us to answer that question and three years to show what we can do. Looking beyond individual concerns, and any protectionism, I am convinced that we need to unite to be in with a chance of winning. This first symbolic step must build the foundations to allow skills, wherever they come from to be brought together." 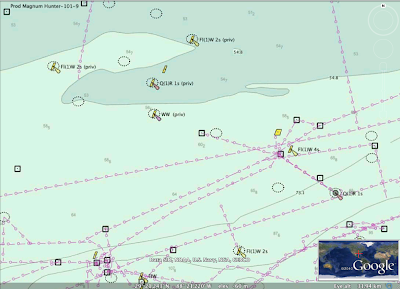 you can have access to 3659 updated charts coming from 7 international Hydrographic Services. Architect Koen Olthuis believes the best way to live with water is to live on water. He explains why he wants to lead Holland — and the world — toward an amphibious future. It might seem to be a futuristic scene like the one depicted in Kevin Reynolds’s 1995 movie “Waterworld”. But floating pavilions and cities may in fact help communities adapt to the effects of climate change, as well as meet the challenges of ever-rising real estate prices and congestion in urban areas. Sea levels rose as much as 20 centimeters, or 7.8 inches, over the course of the 20th century, and the Intergovernmental Panel on Climate Change estimates a rise of 18 to 59 centimeters by 2099. In low-lying, heavily populated deltas used for agriculture, like those in Bangladesh, China and Egypt, such rises will have a devastating impact. Eleven of the world’s 15 largest cities are built on coastal estuaries. The two largest, Shanghai and Mumbai, have populations of 19.21 million and 13.83 million, respectively, and such rises in sea level would have disastrous consequences for both. In India alone, land losses could range from 1,000 to 2,000 square kilometers, or 385 to 770 square miles, by 2030, destroying as many as 150,000 livelihoods, according to the United Nations Food and Agriculture Organization. As traditional land use or creating landfills is not a sustainable answer to the unpredictable effects of climate change, DeltaSync believes floating-city technology offers a better solution. In countries like the Netherlands, where approximately half of the land lies less than a meter above sea level, such technology is a viable alternative to repeated raising of dikes, which must be altered in accordance with rising sea levels. Floating constructions naturally rise with the water level, negating the need for adjustments or rebuilding. Floating cities could also be a practical solution to overpopulation and congestion, opening up the possibility of more space for civilian housing and public buildings. In New York City, almost half of all high school students were studying in overcrowded conditions in the 2008-9 school year, according to the Independent Budget Office, which provides nonpartisan budget information about the city. Creating a floating facility could be a practical answer to such congestion-related problems. “Constructing floating buildings is a promising solution,” Mr. de Graaf said. The world’s first floating pavilion was built in Rotterdam. It was constructed as a response to the city’s objectives to reduce CO2 emissions by 50 percent and to ensure that Rotterdam remains climate-change resilient in the future. “Twelve months ago, all we had was a sketch, a plan, and the drive to make it work,” said Rob Tummers, building director of Dura Vermeer, the construction group behind the pavilion, when the structure was formally unveiled to the public on June 26. The construction, which took just six months to complete, was built directly on the water, rather than on a dry dock. It serves as an exhibition and reception space focusing on Rotterdam’s water management, climate change and energy. The pavilion is 12 meters high, with a floor space the size of four tennis courts, and can accommodate approximately 500 visitors. It has a plaza and dome section, including an auditorium that can seat up to 150 guests. Although it can be moved, it will remain moored in the Rijnhaven port for five years. To ensure that the pavilion remained lightweight and thus unsinkable, it was constructed using five layers of expanded polystyrene sheets, the thinnest layer measuring 20 centimeters and the thickest 75 centimeters, and made buoyant by tiny air-permeated cells. The thickest layer contained a grid of concrete beams and was fastened to prefabricated concrete slabs, forming the hard shell of the island and acting as a protection against waves. The subsequent addition of a 20-centimeter-thick concrete floor made the island’s total thickness 2.25 meters and rendered the floating island a rigid unit. “Building three to four levels high is possible without problems,” Mr. de Graaf said, addressing concerns about the stability of the structure. In order to continue to keep the weight to a minimum, the domes of the pavilion were clad with special ETFE foil, a transparent material that is approximately 100 times lighter than glass. The pavilion is connected to the mainland by a footbridge. The construction also implements a Thermal Energy Storage system, with layers of water acting as insulation for the storage facility, maintaining a sustainable energy and hot water supply through solar panels. Water is collected through rain-water harvesting, or by drawing from the large reserve on which the pavilion floats. Subsequent constructions would adopt similar techniques, with the goal that floating cities be self-sufficient in terms of both water and energy supply, relying on solar energy and surface water. Even the toilet water will be purified by its own system. Mr. de Graaf, also a civil engineer, is in talks with officials in New York and other cities. “We are talking about starting up a data collection study to gain more insight in the water quality aspects of building on water,” he said. Rotterdam’s pioneering model could be the first of many to come, as such projects are not unique to DeltaSync. Waterstudio.NL , an architectural and city planning company, has unveiled similar innovations to build floating structures. Its master plan, called Het Nieuwe Water, or The New Water, is geared toward “a new relationship with the water”. The project was presented to the 2009 World Architecture News Awards and is “one of the leading projects of architectural homes,” according to its architect, Koen Olthuis. The project includes a total of 1,200 new houses, of which some 600 will be floating. The planned area of development is one of the lowest areas of the Netherlands, between The Hague, the North Sea beach and Rotterdam, on land reclaimed from the sea. It once housed greenhouses, but these have now been cleared to make way for the project. The first stage of the project will be construction of Citadel, the world’s first floating apartment complex, with a planned 60 luxury apartments, including parking spaces and large terraces. The New Water is scheduled for completion by 2017. In response to a motion by the U.S. DOJ Department of Justice (Environment and Natural Resources Division), the U.S. District Court in New Orleans has ordered the establishment of a security zone extending 750 feet in all directions from the mobile offshore drilling unit Deepwater Horizon wreckage site and its debris field. 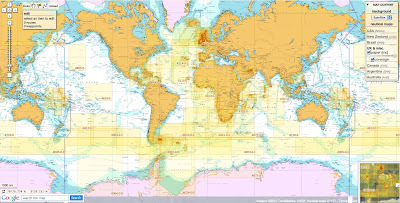 The security zone extends from the center of the wreckage site, which is located at the precise coordinates N28°54.91/W088°22.0293 (in the area known as the Mississippi Canyon 252) from the sea floor of the Gulf of Mexico to the sea surface. The court found it in the interest of the public to protect the search area and any evidence located in the area against intentional or unintentional loss, the order said. It ordered the United States to inform the public and advise all known parties capable of intruding into the security zone. In accordance with the order, the Department of Justice has informed those companies known to have the means and equipment to do so not to enter the security zone. The order will be enforced by the United States using the full range of security assets available, including vessels, aircraft or other appropriate means and equipment. The security zone will remain in place until Oct. 8, 2011 unless renewed for good cause, the court ordered. A nautical chart is a "road map" to waterways where you take your boat. It has a compass rose to give you a true bearing in which to steer your boat. We plot or read our charts in true north. However, our compass on board will always point to magnetic north. This is the magnetic pull of the earth. The difference between true north and magnetic north is called variation. Variation alternates depending on your geographic location. To determine the variation, look at the rose on your chart. It will show the degree of variation and indicate if it is east or west. The formula for converting magnetic north to true north is T-V-M-D-C.
T is for true course, V for variation, M for magnetic course, D is for deviation (this is the effect of the magnetic pull of your vessel) and C for compass course. Deviation can be affected by something as simple as a screwdriver or a set of keys laying alongside your compass. The compass course is the course you steer. Course: 87 degrees. 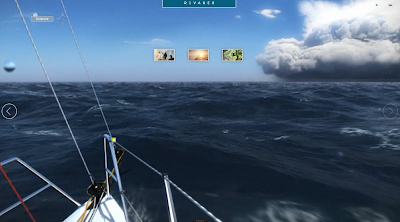 This is the course you will steer. As you work down the equation, add west and subtract east on both variation and deviation. An easy way to remember this: east is least, or minus; west is best, or plus. Most of us cruising on the Caloosahatchee, Pine Island Sound, Matlacha Pass or the Gulf of Mexico use landmarks, bridges, markers or buoys to come and go to our destination. However, you could get caught in fog, rain or darkness, resulting in limited visibility. Then, you will have to depend on your charts and compass to navigate. If you steer a compass course without correcting true north from magnetic north in our example, you would have been 13 degrees off course. This would put you in trouble anywhere in this area, except way out in the Gulf. Learning to navigate can be challenging. It can seem like there is a lot to learn, but with practice, mastering the art of navigation is very rewarding. Learn the ins and outs of seamanship by taking the courses given by the Cape Coral Power Squadron, located at 917 SE 47th Terrace. For more information, call 549-9754. 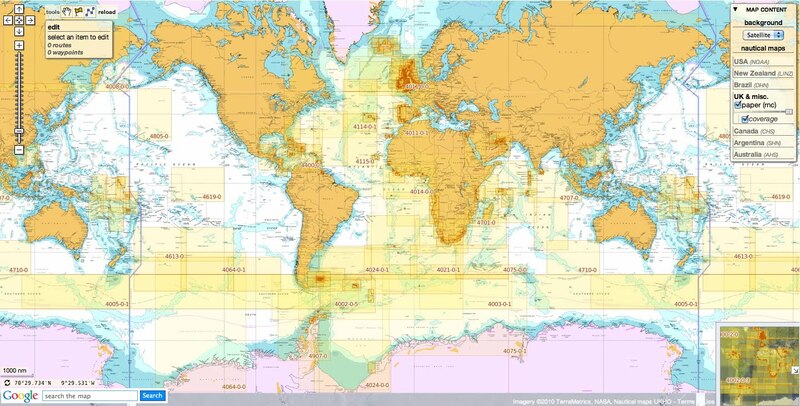 Right now, each nautical maps layer proposes a new feature to display the reference (number) for all the raster charts issued from each international Hydrographic Service. To activate this feature, select the map layer and click on the 'coverage' button to see the different geographical areas. This feature is available whatever you are logged in or not. For 'private' layers depending on royalties to Hydrographic Services (UK & misc., Canada, Australia...), this allows the user to know exactly what he buys, subscribing to a 'Premium Charts' account. 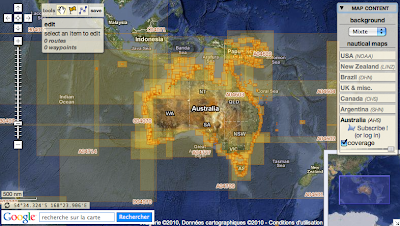 Have a look to this surface temperature animation from Mercator Ocean new hourly frequency model. This incredibly figures out two cycles : tide movement in the Atlantic Ocean and the diurnal cycle. 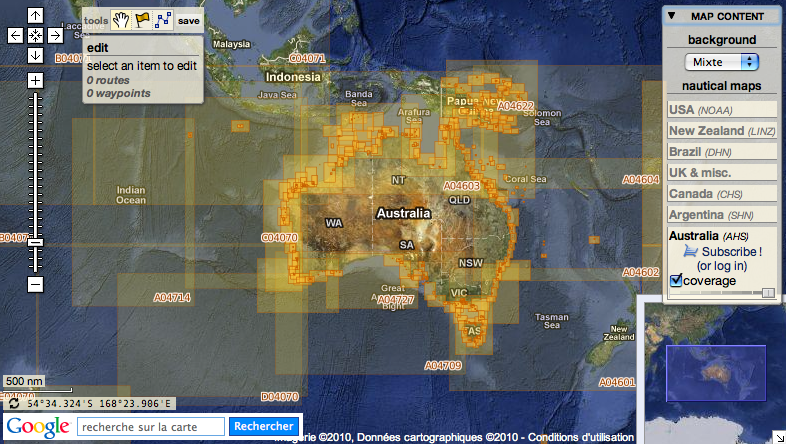 This animation represents the sea surface temperature with a 2km grid ocean model during the two weeks (spring 2010). There colder Atlantic Ocean waters enter the warmer Mediterranean Sea. Sea Surface Temperature shows all the wealth of marine features that can be seen in this area. The "entry" to the Mediterranean is the Gibraltar Strait. There, cold water Atlantic waters enter the warmer Mediterranean Sea. Depending on the season, in the Alboran Sea just East of Gibraltar, one or two gyre(s) (semi-permanent eddies) can be seen; in Summer, a warm (anticyclonic) one at the very beginning of the Alboran Sea, and another one just after, also anticyclonic but slightly less warm. Further East, there is a zone of intense activity along the Algerian coast. Eddies and meanders in the Algerian Current are among the most turbulent features of the Mediterranean-but some are more stable. The Sea Surface Temperature is one of the important physical quantities proposed by MyOcean, from observations as well as from models. It is sensitive to the difference between night and day (the Sun warming the upper layer of the ocean). With an hourly frequency, the pulse of those daily variations can be seen. The Sea Surface Temperature is of foremost use in meteorology and climate forecasts (e.g. the Mediterranean Coast of France know every beginning of Autumn heavy rainfalls linked to the Sea temperature; seasonal forecasts won't be possible without ocean temperature...). Life in the water is also driven by temperature, with phytoplankton more abundant where the temperature is low, etc. It is also a sea of mystery. According to the myths of Ulysses and Jason, the Greeks' voyages of adventure took them to the four corners of the Mediterranean, from the Pillars of Hercules in the west (Gibraltar) to Hellespont in the east (Dardanelles). In later years the Mediterranean linked the various parts of the vast Roman Empire. Indeed, such was the Romans' dominance on all sides of the Mediterranean basin that they called it "our sea" (Mare Nostrum). And it was here that Orient met Occident as Islam and Christianity fought to wrest this strategic prize from each other's grasp. Today, it is one of the world's main commercial routes. Oceanography programs have been set up to study its movements and its fragile ecosystem. These programs rely on satellite and in situ observations, and on ocean models, merging a wealth data to piece together the Mediterranean puzzle. to invite the largest audience possible to visit their boat in 3D. Michel Desjoyeaux, France's most successful solo yachtsman, is impassioned not only by sailing and competition but also by technology and innovation. At the beginning of 2010, Michel Desjoyeaux set a new challenge for himself: construct a new 60 ft monohull in order to vie for victory in the Route du Rhum (a transatlantic solo yacht race that begins next Sunday, October 31, 2010) and the Barcelona World Race (two-handed, non-stop, round the world race starting December 31, 2010). Although it normally takes 10 months to design this type of boat, Michel Desjoyeaux has less than 6 months to construct his new monohull and develop the technical innovations that will permit him to distance himself from his competitors. In other words, a never-before-seen in such a short time! Trained by Dassault Systèmes engineers, the team at Michel Desjoyeaux's engineering and design studio, Mer Forte, was able to conceive and realize numerous innovations during the design phases and the construction of the sailboat. This particularly allowed them to fine tune and perfect the kinematics of the keel/jack assembly. The CATIA software feature that calculates the finished elements of complex composite parts made the quick optimization and validation of major parts such as the rudder housings, the tiller system and even the boom (saving a significant amount of weight) much easier. His love for sailing is matched by his desire to conceive and develop the boats that he sails. Sharing this passion with the general public is a part of the challenge he has set for himself. A nuclear-powered submarine may have run aground on a shingle bank because the charts it was using were out of date, sources have said. HMS Astute was on sea trials when the rudder of the vessel is thought to have become stuck on the bank on the west coast of Scotland at around 8am on Friday. The Royal Navy has launched a service inquiry into why the 100m-long submarine ran aground in the channel between Skye and Kyle of Lochalsh. One of the possibilities being explored is that out of date charts had not accurately mapped the shifting sea channels off the Isle of Skye. The vessel is understood to have strayed several hundred yards outside the safe sea lane marked on Admiralty charts. A Royal Navy source told the Mail on Sunday: "One of the things that is being looked at is if the charts were up to date with the recent seabed changes in the area. The seabed can change quickly." The Ministry of Defence said the investigation into the incident would be "full and thorough". The investigation will also consider if any crew were negligent and the submarine's skipper, Commander Andy Coles, could find himself in front of a court martial. But a Ministry of Defence spokesman said it would be "inappropriate" to comment on the possibility of disciplinary action until the investigation is complete. It is believed a crew transfer from the shore to the submarine was being carried out when the incident happened between the Isle of Skye and the mainland. There were no reports of any injuries and the Ministry of Defence said it was not a "nuclear incident". Dozens of people gathering on a nearby beach could clearly see that the Astute was sitting well outside normal shipping channels, and tilting slightly. Ross McKerlach, operational manager at Kyle of Lochalsh lifeboat station, said the submarine was a full six miles from where it would normally lie overnight, and had run aground in water too shallow even for his own small motor boat. “Where he was is in between two rocks and on a sandbank,” he said. Independent nuclear expert John Large said the accident could lead to costly repairs, and was most likely caused by a “navigational error”. Mike Critchley, a former naval officer and the editor of Warship World magazine, said the accident was likely to have been caused by a navigation error or technical failure of the steering gear. "She was a long way out of where she should have been to do this transfer. It was 800 yards away from where it should have been and grounded in shale and silt and not jagged rocks. 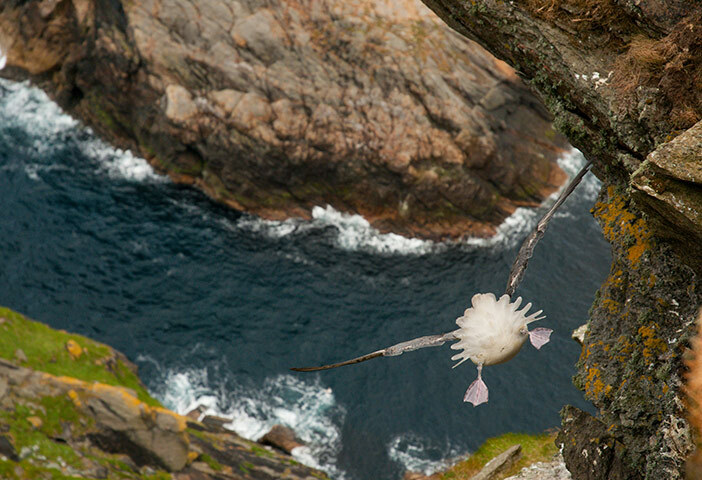 The world’s most prestigious wildlife photography competition, Veolia Environnement Wildlife Photographer of the Year, has revealed the commended images from this year’s competition. They are among the selection that will join more than 100 other prize-winning photographs, including the overall winning images, when the exhibition debuts at the Natural History Museum, London on 22 October 2010. It will then tour nationally and internationally after its launch in the English capital. More than one million visitors are expected to have seen the exhibition once the tour is complete.